Waiting for Paul Simon… Couldn’t resist sneaking a photo. And by sneaking, I mean I wasn’t actually allowed to, but I couldn’t help myself. I mean, I was about to see Paul Friggin’ Simon, the awesome legend. C’mon. 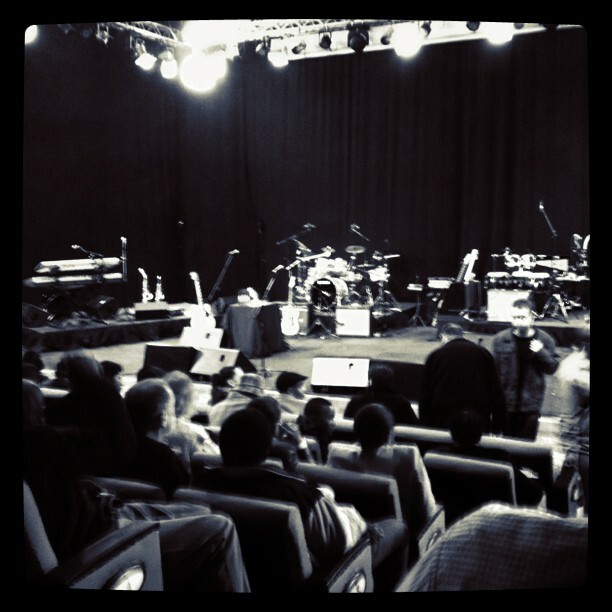 He played an intimate gig tonight at the SABC, which was recorded. It’s my understanding that this is for the 25th anniversary of Graceland (which is next year). It was pretty much a Graceland reunion gig with Hugh Masekela, Ray Phiri, Ladysmith Black Mambazo…all the greats. It was incredible, and even included a tribute to Miriam Makeba. The atmosphere was electric. “Boy In The Bubble” was my personal highlight, but nothing beats singing along to “You Can Call Me Al” with 300 other people, including Paul Simon. He released a new album this year, “So Beautiful Or So What,” and I think it’s his best since Graceland. In many ways it actually reminds me a lot of his debut album, check it out at his official website. Author WendyPosted on July 28, 2011 August 19, 2017 Categories Live Music, MusicTags Entertainment, Events, Paul SimonLeave a comment on Waiting for Paul Simon… Couldn’t resist sneaking a photo.